Mr. Taha Arakama (front), Officer-in-charge, city DILG office, with some of the participants. 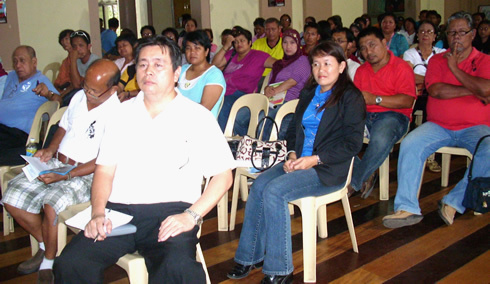 At least 168 barangay officials coming from the 98 barangays of Zamboanga City attended the orientation on RA 9208, otherwise known as the Anti-Trafficking in Persons Act of 2003, which was held on April 25 at the Western Mindanao State University (WMSU) Social Hall, this city. They were welcomed by WMSU President Dr. Grace J. Rebollos. The orientation was spearheaded by WMSU, under its President Dr. Grace J. Rebollos, through the WMSU- Center for Peace and Development (WMSU-CPD) headed by its Director, Dr. Marcelina G. Carpizo; in collaboration with the Katilingban Para sa Kalambuan, Inc. (KKI) led by its Chairperson, Fr. Angel Calvo, CMF and the Executive Director, Ms. Elsa Manabat; and with the city office of the Department of Interior and Local Government (DILG) which was represented by Mr. Taha Arakama, officer-in-charge and Ms. Annangsita S. Hassan, Local Government Operations Officer III. The activity aimed to empower barangay officials to wage war against this growing global malady by raising their awareness and deepening their understanding of the nature of the crime, as well as their role as guardians of their constituents’ welfare. Dr. Marcelina G. Carpizo, WMSU-CPD director, presented a very comprehensive lecture on the salient features of RA 9208. She put a human face on the issue of human trafficking, particularly of children, by presenting a movie in caricature titled, “Red Leaves Falling” by Monica Ray. The presentation ripped at the hearts of the participants, men and women alike. It vividly portrayed the elements of trafficking which are the act, transport and the purpose of the recruitment. In an open forum that followed, the participants expressed utter disgust over the inhuman treatment to which victims are subjected to by their perpetrators, with impunity. They likewise expressed their commitment to help protect their women and children from being victimized. Meanwhile, city DILG officer-in-charge Mr. Taha Arakama challenged the barangay officials to reconstitute and strengthen their respective committees on Violence Against Women. He also encouraged them to let the Barangay Committee on the Protection of Children (BCPC) map out strategies to protect women and children. To ensure that women and children concerns are well-embedded in their respective barangay development plans, Arakama asked the barangay officials to revisit this document. Most of all, he urged them to create and promote employment and increase livelihood activities in their localities.